Starting with first sketches in 1959, Robert Venturi - then a young architect - designed a house for his mother Mrs Vanna Venturi in the Chestnut Hill neighbourhood of Philadelphia, Pennsylvania. The structure which Venturi caracterised as "a little house with big scale, symbolizing shelter" is centered on the chimney and hearth; the chimney splits the structure and space extend outward from the hearth. It was completed in 1964. 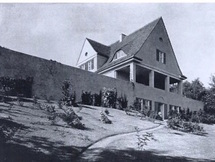 The Vanna Venturi House, although being one of his first constructions, soon became a platform from which Venturi reached an international acclaim. In testing his beliefs on complexity and contradiction (for which he also wrote the book Complexity and Contradiction in Architecture), Venturi went through six fully worked-out versions of the house which later became known as the first example of Postmodern architecture and served as a reference for contemporary architecture evidenced by the fact that one can find more than 5.000 written reviews that show the house as a protagonist of a fierce debate about the sources of architecture at the end of the 20th century. to counterbalance the complexity. Complexity in combination with small scale in small buildings creates a nervous busyness - whereas big scale in this small building achieves an appropriate architectural tension." "The inside spaces are complex both in shapes and interrelationships. The plan is symmetrical, but the symmetry is distorted at times to accommodate the particular needs of the spaces. For instance, two vertical elements - the fireplace-chimney and the stair - compete, as it were, for central position. Consequently, on one side the fireplace distorts in shape and it and the chimney move over a little; on the other side the stair constricts its width and changes its path because of the chimney. In contrast, the outside form is simple and consistent, the front creates an almost symbolic image of a house. However, it also reflects the inside complexities through the varying locations and sizes and shapes of the windows, perforations in the outside walls, and the off-center location of the chimney. The walls are layered to indicate enclosure yet punctured for openness. For instance, at the front center, where the outside wall is superimposed upon the two other walls housing the stair, each juxtaposes openings of differing size and position, becoming layered space rather than interpenetrated space."